Register with us to receive regular offerspecials and a FREE bucket of balls. Royal Scot features 18 holes of challenging golf over a beautiful landscape. 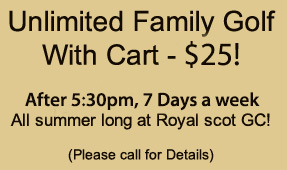 Royal Scot is known as one of the premier golf courses in the Green Bay area and is also voted for having some of the best greens in the area. Royal Scot has a fully-irrigated practice facility allowing you to sharpen up any area of your game. From our large grass tee off area to our target green and yardage markers ranging all the way out to 250 yards, it gives any golfer plenty of targets to aim for. If you are looking to set up a private lesson, we have 2 professionals with over 60 years of combined golf experience to help you in any area of your game. The bar and grill in the pro shop is open 7 days a week to the public serving all your favorite beverages, burgers, pizzas, cold sandwiches and other short order items off our grill. We also offer free Wireless Internet to all our customers. Why sit at the office during the summer months, when you can bring your work AND your golf clubs both to the golf course. The boss will never know you're gone!!! Book your tee time today. Call (920) 866-2356 or Book a Tee Time Online.